It's summer and that means making time to hang out in the kitchen and work on a cooking project or two with my son. Most recently, we made a Texas sheet cake together, and it was such fun! I'm calling it "Texas sheet cake" rather loosely because although there doesn't seem to be a definitive explanation for the term, "Texas sheet cake", our version omits a lot of what makes it what it is. Specifically, we didn't bake the cake in a sheet pan; rather, I divided the recipe in half and baked it in a 9-inch square brownie pan (hence, the cake isn't Texas-style "big", either). We also omitted two things - ground cinnamon and pecans - that you often find in a classic Texas sheet cake. I decided to forego them because my son isn't a big fan of those ingredients and frankly, I wanted to make sure he'd enjoy what we baked. There was another reason I thought of making this cake with my main man (aside from the somewhat obvious consideration that this super sweet treat would go down well). We recently took a road trip to Virginia. After many hours on the road (traffic on I-95 is no joke and we also had to contend with a flat tire midway there), we stopped into a Cracker Barrel to eat and I ordered a slice of Coca Cola cake for us to try for dessert. Not surprisingly, the little one was a big fan of that and I thought this cake would be very similar (it is) and a fun thing to make now right after the trip. To make a long story shorter, my little guy gave our cooking collaboration two-thumbs up! I tell you - this is a sweet cake, with a moist, fluffy texture. The icing is poured on the top of the warm cake and it seeps slightly into the cake, making it all the more moist. It goes down very easy and has a nostalgic flavor to it somehow. It's certainly true when people say that kids will enjoy things they helped to make (though maybe I should make something vegetarian with him next time to test that theory); I just think it's doubly true when what they made was cake - and Texas sheet cake, at that! He gobbled up his fair share of this cake and his dad was certainly another very happy beneficiary of this kitchen session of ours. For my part, the best thing was spending the time in the kitchen together, watching my son do so much now, and sharing an enthusiasm for something together. That's even better than eating cake! I let the little guy do most of the cooking and he was really up to the challenge. Since we were dividing a recipe in half, we also got to do a little math together, too! I'll let some pictures tell most of story but he did things from working at the stove (to melt butter, cocoa, and water together in the initial step as well as for the icing) to whisking the batter together and sifting powdered sugar to make the glaze that goes on top of the cake. It was a unique and interesting baking process and he got to literally make it all by hand while also seeing that it could be done quite easily and quickly. That was fast - all done and ready for the oven! This simple cake is done in no time! You can remove the cake from the pan using the parchment paper overhang, then cut up a few slices. It's a casual enough cake to also make and serve with a big spoon right from the pan itself. As I mentioned, we omitted the ground cinnamon in the cake itself and didn't top the cake with chopped pecans. Given the sweetness of the cake, both these additions are something worth considering. I know my husband and I would have enjoyed a bit of crunch and nuttiness to the cake with the addition of nuts but we easily settled into the simple moist tenderness of the cake. Make cake: Preheat oven to 375 degrees. Lightly butter a 9-inch square cake pan and line it with a piece of parchment, with about a 2-inch overhang on each side. In a large heatproof bowl, whisk together the flour, sugar, baking soda, and salt (also cinnamon, if using). Melt butter in a saucepan over medium-low heat. Whisk in cocoa and 1/2 cup water. Increase heat to medium-high and bring mixture to a boil, whisking occasionally. Pour hot mixture over the dry ingredients and whisk to combine. Lightly whisk the egg together with the buttermilk and vanilla, then add to the batter to combine. Transfer batter (it will be thin and fluid) to the prepared pan, smoothing the top. Bake until a cake tester comes out clean, about 18-20 minutes. Transfer cake, in the pan, to a cooling rack and let stand for about 15 minutes. Pour the icing evenly over the top of the slightly warm cake (if you like, you can remove the cake from the pan using the parchment paper overhang and set it on a rimmed serving platter to glaze). Sprinkle the top with chopped nuts, if using. Let the cake sit and allow the icing to set before serving. 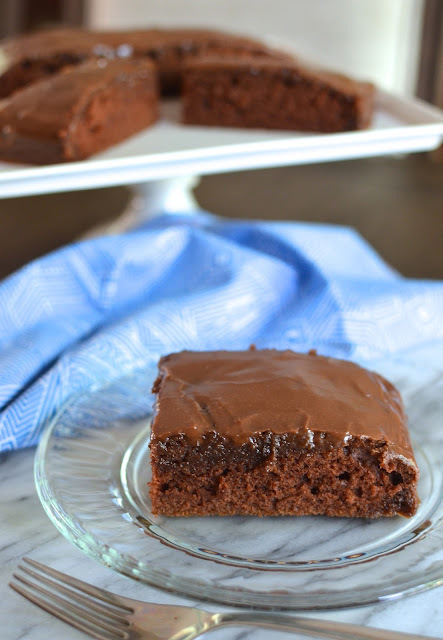 Your chocolate sheet cake has such a soft and light texture that I can only find in sponge cakes. Well done, Monica. I was surprised by how sponge-like it turned out as well. So nice that you and your son bake together, how fun to make things that you know he will enjoy, makes it all that better. Beautiful cake Monica! You are very sweet, Samina. I'd never made this kind of cake before so it was a good experience to share with my fella. Have a good rest of the week now! Love that you and your son have so many wonderful baking adventures together. A coca-cola cake sounds so cool and yay that inspired you guys to make a Texas sheet cake. It looks so chocolaty and amazing!! Yes, I saw the cola cake on the menu and knew we should try it (hard to get something like that here and I knew that would capture his interest). And this is much like that cake in appearance and taste. It was fun in many ways. My mom used to make the best Texas Sheet Cake and often brought it to family functions. I've searched for her old recipe but cannot find anybody that has it. I love that you made this with your son. He will always remember those special days together and who wouldn't want a big slice of this gorgeous cake! It must have been hard to wait while you took photos - have a great weekend! Proud mum!! I truly love the idea that you get your sons to help you - this cake is perfect for a chocolate addict like my sweetheart, he saw your post and begged me to bake it for him. This method for making a cake is new to me, I should definitely give it a try some time! It was an unusual method for me, too! So interesting and I was surprised by the fluffy, sponge-like cake that it turns out. Have a great weekend! Thanks, Jo! I like making something new with my son so we both have "a-ha" type moments together. It was fun.